I've been playing around with the Shopping Cart Price Rules for Magento Enterprise 1.14.1.0 and have stumbled across a problem. I was trying to create a simple rule such that you would get a £10 discount if you buy any 3 items from a defined category, and have spent more than £15. See my configuration below. In my basket I have 3 items from the category with id 5, and 1 item from the category with id 3. When I enable this rule and view my basket, I receive the fatal error. Here's a section of the stack trace. As you can see I've already bumped up the xdebug.max_nesting_level to horrifying levels. 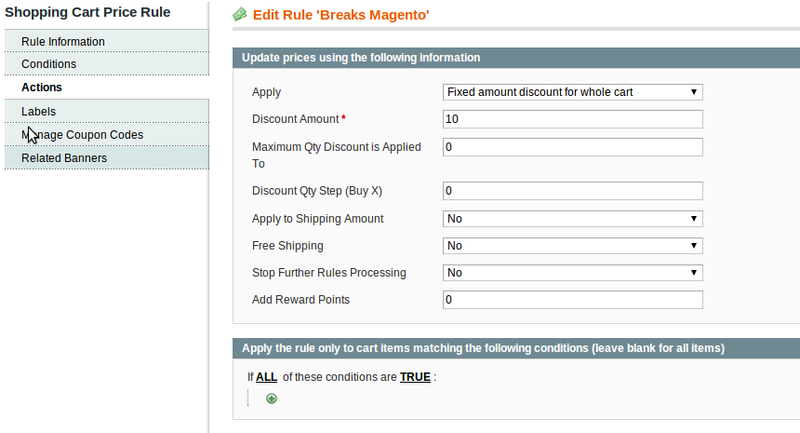 When I remove the If total quantity is 3 section from the Condition then Magento no longer freaks out. Could someone point me in the correct way to configure this promotion, as well as shed some light on why I'm fataling? This is a vanilla installation of Magento, and I'm concerned that I can break the shopping cart so easily. A database dump is available here, comes in at ~130kb. You'll need to update the web/unsecure/base_url and web/secure/base_url in core_config_data to point to your install instance. It's origin is in the product subselection. These two functions who are calling itself repeatedly. It is indeed a Magento bug because it doesn't check if it is a valid item passed to the function. Normally the function is called with Mage_Sales_Model_Quote_Address and in the recursion with Mage_Sales_Model_Quote_Item so we can build a fix for it. Both also have a getQuote() function. If you want to resolve it in you case it is done by adding these tree lines. So my last check is to see if it also applies for Magento CE 1.9.1.0 This is also the case because the parent function is implemented in the CE edition. Magento CE 1.9.0.1 is not affected, it does not has the parent function! So I'm guessing Magento EE 1.13.1.0 is also free from this, because the are inherent to each other. You should create a ticket in your Magento Enterprise account and supply the information so they can make a patch for this. Not the answer you're looking for? 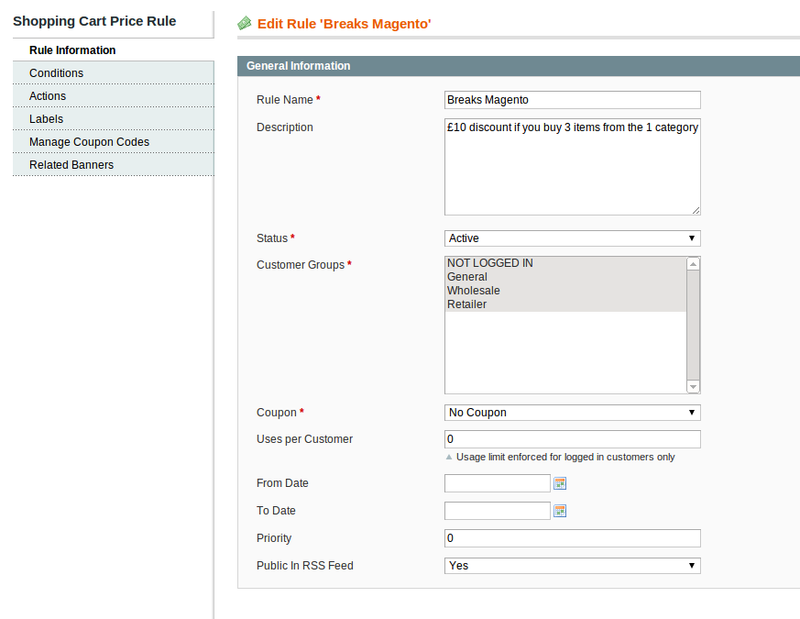 Browse other questions tagged magento-enterprise shopping-cart-price-rules promotions enterprise-1.14 magento-1.14 or ask your own question.